With the turbulent business environment, and rating agencies, boards, banking regulators and other agencies increasing their focus on a company’s ability to manage critical risk issues, the time to evaluate your current risk management practices and update your program is now. Ensuring your organization’s program is founded on a systematic, proactive approach will enable you to leverage risk to your competitive advantage. 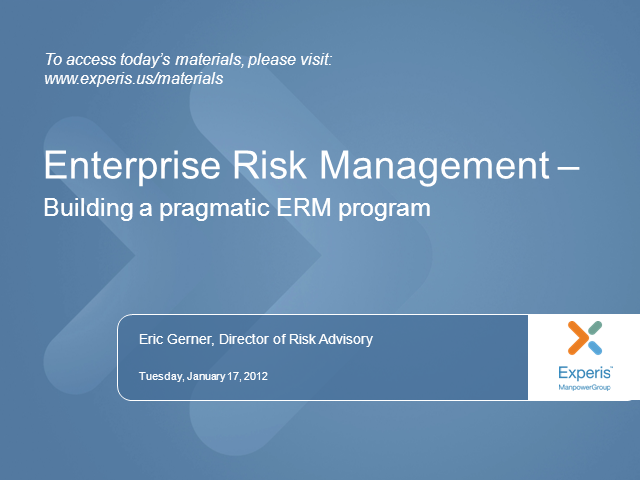 This Webinar will provide you with a proactive road map to evaluating your current risk program and incorporating the steps to a more practical, proactive ERM approach.